It’s easy to make mistakes when you’re driving, as it’s such a complicated process. You may have seen someone you know prosecuted for speeding, or you could be back on the road after a ban yourself; either way, you are keen to avoid having to call someone like Kenway Miller motoring solicitors. Here’s how to stay out of trouble. Our modern cars are so large and comfortable that you don’t necessarily feel how fast you’re going, so don’t rely on your perception. If you’ve just come off a motorway, 40mph may well feel like walking pace, but if you’re now in a 30mph zone, you could be in trouble. Always look out for speed limit signs; lots of drivers who get caught out say they believed the limit to be higher. Don’t just assume, for example, that a dual carriageway has a 70mph limit as some have limits of 40mph or even 30mph. Speed signs are often at junctions because the limits often change there, so watch out for them. If you get distracted by navigating the junction, watch out for repeater signs and if you don’t see one immediately, drive at a lower speed until you do see one. You might be wrong and the speed limit is actually 30mph, but it’s safer to assume it’s 20mph. It’s a limit, not a target! You don’t have to aim for 70mph. At some times and places, driving just under the limit isn’t safe – school home-time, when it’s raining, when you’re passing a popular park, or when there’s roadworks are good examples. This poor judgement isn’t just restricted to taste in clothes and music, it extends to assessing speed, distances and risk. Dozens of children are killed on UK roads every year and realistically, it’s up the adults around them to compensate for their lack of experience by driving more slowly in areas where they’re likely to be. The difference between 20mph and 30mph can literally be life and death – be that difference. Do you speed when listening to loud music? Or when you give your favourite colleague a lift into work? Are you an aggressive overtaker? If you know what makes you hit the gas, work to change this. 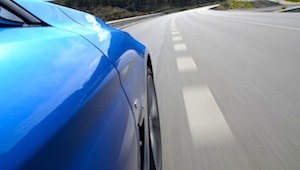 Keeping the two-second rule (maintaining a two-second gap between your car and the one in front) helps you to monitor and regulate your speed. If it’s wet or icy on the roads, make it a four-second gap. Don’t give your brain too much to do when you’re driving – no applying lipstick, no texting (seriously!) and no lighting cigarettes. Anything that takes your mind off driving is a potential danger, and, in the case of using a phone, illegal. The areas around villages may have 60mph speed limits, but they are stepped down as you approach the settlements. Pay attention to the signs and aim for 20mph; yes it’s slow-going, but it could save someone’s life.